The Windham Eagle Sports: Athlete Of The Week - Lingdong Bol (Ling). Congratulations! Athlete Of The Week - Lingdong Bol (Ling). Congratulations! Lingdong Bol, a junior at Windham High School is The Windham Eagle’s athlete of the week. The 17 year-old is a mid-fielder in soccer, a forward in basketball and a high jumper, triple jumper and long jumper in track and field. By playing sports, Bol has learned there is always room for improvement. She believes that cheering from the sidelines is a great way to encourage the players - which can make all the difference in the world. She accredits many people who have made an influence on her sports career. They include her South Portland coach, Karen Reardon, her good friend, Phoebe Letourneau and her mother. “Ling has been a great addition to our girls indoor track team. She is a very coachable and passionate athletic but most of all she is a great teammate. She placed first in the SMAA league high jump this past weekend and plays a huge role in our team’s success this winter,” girl’s indoor track head coach Mary Green said. Bol hopes to attend either Bucknell or Brandeis Universities and major in medicine. 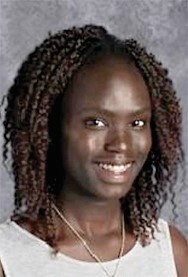 She is the daughter of two Sudanese immigrants, mother Nyabore Luak and father, Bol Bol. She also lives with five brothers and two sisters.